Much has been made of the burdens of the Affordable Care Act on healthy young men, but young women are the ones most likely to see the law push them out of full-time work. A “29er” refers to someone working 29 hours per week, the maximum that an hourly employee can work and still be considered part time by the federal government, as defined under the Affordable Care Act. Before 2014, when the new federal definition took effect, Census Bureau data suggest that hardly anyone worked exactly 29 hours a week: about one in 1,000. Only six in 1,000 worked 26 to 29 hours a week. The Affordable Care Act requires that, beginning next January, large employers provide health insurance for their full-time employees (by the federal definition) or pay a penalty per full-time employee on the payroll. The annual penalty is $2,000 and, unlike employee salaries and benefits, is not deductible from business taxes. Small employers do not owe a penalty, unless they cross the 50-employee threshold, in which case the annual penalty is $40,000 for having that 50th employee. Subsequent hires would each carry a $2,000 annual penalty. Part-time employees do not create a health-insurance requirement or a penalty for their employer, which gives large and small employers an incentive to reduce at least some employees’ hours to 29 hours. A number of employers plan to do exactly this. But the incentives are not limited to penalty avoidance by employers, and began this month. Employees in families with income of less than 400 percent of the poverty line will lose access to generous federal subsidies if they make themselves eligible for employer health coverage by working full time at an employer that offers coverage to such employees. In other words, employees may have something to gain, or less to lose than they did before this year, by limiting themselves to a 29-hour work schedule. For full-time salaried workers (as opposed to hourly workers) the federal definition is those who work more than three days a week. (For the purposes of discussion, I will refer to the three-day limit as “29 hours,” although in practice it may be, say, a 26-hour schedule). As the new law goes into full effect the next couple of years, I expect that more than 2 percent of workers will be 29ers, an increase by more than a factor of 10. 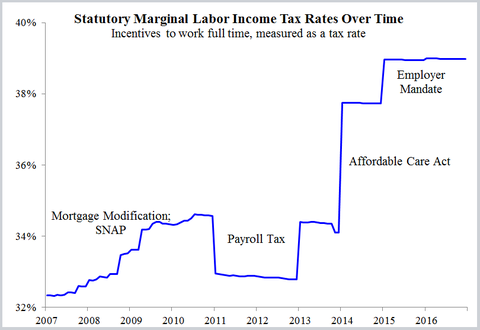 Moreover, as the labor market adjusts to avoid penalties and enhance subsidies, the adjustments will tend to be those that are least costly. One of the least costly ways to move full-time workers to the 29er group would be to focus on those who already work slightly more than 29 hours. It is usually less costly for a 35-hour-per-week worker to cut hours to 29 than for a 55-hour-per-week worker to do so. I used the Census Bureau’s data to put together a sample of people likely to be 29ers over the next couple of years, based on working 30 to 37 hours per week before this year and not having health insurance available through a spouse (if married). Women outnumber men more than 2 to 1 among likely 29ers. The 29ers are also likely to be less than 30 years old. Naturally, working fewer hours means less pay. By disproportionately reducing women’s work hours, health reform may have the unintended consequence of increasing the gap between men’s and women’s wages and salaries. “Jury service is a serious, meaningful and important responsibility,” says Cook County Court in Illinois and many other courts in the United States. Yet the courts pay jurors far less than minimum wage. In Cook County, jurors are paid $17.20 a day; working eight hours at the state’s minimum wage would pay almost quadruple that. Employers are sometimes forced by state law to pay jurors while they serve the court, but that is no help for the self-employed, students and people without jobs. Jurors are selected randomly from state-compiled lists of residents and forced to participate unless excused by the court for specific circumstances, such as a medical condition that prevents service. People who do not report for duty can be punished at to the court’s discretion, including jail time. With random selection, low pay, medical excuses and the potential for severe punishment, a jury summons has a lot in common with a Vietnam-era draft notice, although, of course, the skill and activities associated with the service itself is far different for jurors than for Vietnam soldiers. Many people summoned for jury duty search desperately for excuses. Their efforts increase the burden on the court system, which has to summon and process a large number of people in order to empanel its juries. The court system might alleviate these problems by following the example of the modern military: recruit people for service by paying them far more than minimum wage. Jurors could still be selected randomly, but with a nice paycheck waiting for them, they would not try as hard (or at all) to be excused by the court. Critics of a market-oriented recruitment system might say the pool of jurors would not fully represent the population because, among other things, people getting high pay in their normal jobs would be less willing to serve on a jury because of the loss of pay. But let’s not pretend that the conscripted jurors we have today are a random sample of the population. If jurors were paid at a generous hourly rate, might they deliberate longer? And would that be a good thing or not? If it were desirable to shorten juror deliberation time, jurors could be paid a flat rate for that part of their service. The Fifth Amendment to the United States Constitution prohibits the taking of private property “for public use, without just compensation.” Did the founding fathers really think that it was much worse to take property without just compensation than to take a citizen’s time? Taking property and drafting citizens into government service without market compensation have many of the same economic problems: they fail to spread the burden of supporting government activity, they encourage socially wasteful avoidance behaviors, and enforcement runs the risk of special treatment for the politically connected. The modern military pays soldiers with both appreciation and money. Jurors should be paid that way, too. It is easy to exaggerate the importance of economic ideas in shaping public policy. The United States’ move to an all-volunteer army is a good example. Public policies change over time, as with the emergence of the income tax early in the 20th century, deregulation of airlines and banking and the recruiting methods of the military. In each instance, economists and other intellectuals offer arguments and research results that help inform the policy change. But intellectuals often press for policy changes that never happen, and I suspect that a number of interesting and helpful policy proposals are hardly researched or discussed because they are deemed “politically infeasible.” So it’s possible that – for reasons related to new costs, technologies and so on – policies would change even if intellectuals said nothing about their ideas and policy research results. Or that scholars’ ideas are sometimes only a minor force among many that drive public policy changes. Military conscription is a case in point. Economists were studying the topic in the 1960s. At that time, the United States military had long recruited much of its manpower through conscription, forcing able young men to join or inducing them to “volunteer” to avoid being forced into service. Economists tended to appreciate an alternative approach: recruiting the entire military through the market mechanism, offering soldiers enough pay and benefits that they willingly give up civilian activities in order to join. But it seemed unlikely that politicians would come around to their thinking, which is why most economists spent their time researching other subjects (the economist Gary Becker wrote an article about how he abandoned his study). But the late Prof. Walter Oi and a handful of others (some of the work has been collected in “Conscription“) plowed ahead. Professor Oi showed how the Defense Department budget and work-force efficiency would be different if the government eliminated the draft and recruited its personnel on a voluntary basis. Less than a decade later, the United States did in fact eliminate the draft. It seems, as the economists David Henderson and Steve Landsburg put it, that young men of today should thank Professor Oi and the few other economists whose work helped end military conscription in the United States. But regardless of what economists were saying, I suspect that the military and the politicians who direct them would have changed the policy anyway, because the costs and benefits of the draft were changing, in large part because of technological progress. By the 21st century, the United States was fighting with more capital intensity and less labor intensity than it ever had. Both economic theory and evidence on the costs and benefits of conscription suggest that the size of the force is a primary determinant of whether a country uses the draft to recruit any of its military personnel, whatever the state of intellectual debate on the issue. Compare 1971 (during the Vietnam War), when the armed forces totaled about one-sixth of the male population 15 to 24 years old, with 2003 (a time of wars in Iraq and Afghanistan), when armed forces were only one-fifteenth of the male population that age and an even lesser share of the total population (because by then large numbers of women were serving in a wide range of military occupations). Prof. Andrei Shleifer and I found that the change in United States policy between 1971 and 2003 lines up well with international country patterns of military recruitment, suggesting that costs and benefits may have been behind the policy change, rather than economic research. Nevertheless, economics ironically predicts that actual costs and benefits probably drive more policy changes than economic ideas do. The payroll tax holiday was an important factor helping the workweek recover after the recession, but the holiday is over and new public policies are pushing in the other direction. Full-time positions pay more than part-time positions, even on an hourly basis. Part-time positions require less time away from family, schooling, etc., which makes the choice of full-time versus part-time work a trade-off between income received and the amount of the time commitment. A higher income tax or payroll tax rate tilts the balance toward part-time work because it reduces an important benefit of full-time work: extra income to spend. A lower rate does the opposite. You might say that work schedules are set by employers, and that workers have no say in the matter. But that ignores the fact that employers compete for employees, which is why many employers spend resources to offer health coverage, flexible scheduling and other fringe benefits that employees find attractive. Historically, employers have responded to high income tax rates by creating part-time positions, especially when large numbers of potential employers were facing those rates. For many years, the Social Security earnings limit reduced the reward to full-time work among elderly people, because a large part of their Social Security benefits were withheld when beneficiaries earned more than the limit. As a result of the income tax implicit in the Social Security rules, many businesses created part-time positions that were attractive to older workers because their earnings stayed below the limit, and many accepted them. Between 2007 and 2010, expansions of the food stamp program, known as SNAP, made part-time work increasingly attractive for those who would face the program’s income limit if working full time. About the same time, federal mortgage modification guidelines acted as income-tax increases on homeowners who owed more on their mortgage than their home was worth, because the more the homeowner earned, the less the mortgage balance was reduced. As a result, a few people found part-time work to be a more effective way of cutting their debt. I have quantified the disincentives for full-time work and their evolution, accounting for the fraction of the population taking part in these and other programs and showing the results in the chart below. A higher tax rate means less incentive to work full time and more incentive to work part time. Three economic forces are pushing toward shorter workweeks for employees during the new year. Federal Reserve Bank of St. Louis Average weekly hours of private employees (blue line) have returned to the level last seen before the recession of 2008-9, shown as gray area. But the percentage of Americans with jobs (red line) plummeted in the two years after the recession began and has remained steady since then. By that measure, there has been hardly any labor market recovery because, as indicated by an index value of 93, employment per capita still remains 7 percent below what it was before the recession began. 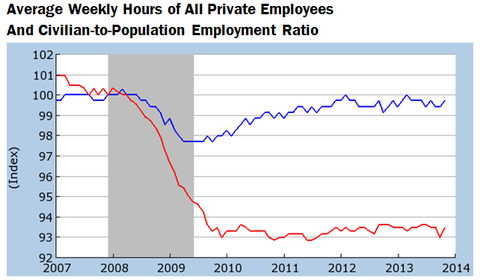 Average weekly hours of private-sector employees (the blue line) returned comparatively quickly to near their prerecession level and have maintained that level over the last two years. I predict that average weekly work hours will decline again over the next year because fiscal policy is now switching from penalizing part-time work to rewarding it. Since 2008, government benefits for the long-term unemployed have served as a penalty for part-time work, because unemployment benefits are largely – if not entirely – withheld when an unemployed person accepts a part-time position. Moreover, people moving to part-time work from either full-time work or unemployment will find that the move renders them eligible for fewer benefits the next time they are laid off from a job. Many of the part-time-work penalties disappear this week when the federal government stops paying long-term unemployment benefits (short-term unemployment benefits will continue, and they embody some of the same incentives), although the penalties would reappear should Congress resurrect the program. Full-time work has traditionally offered health and other benefits that part-time jobs rarely do, and those benefits have kept a number of workers in full-time positions. The Affordable Care Act aims to end that advantage, by giving workers opportunities to obtain insurance outside the workplace. In addition, in some cases the new insurance opportunities can be so inexpensive compared with employer insurance that people stand to, paradoxically, have more disposable income from working part time than they do from working full time. The third economic force is that in January 2015 the Affordable Care Act begins to penalize employers that do not offer affordable health insurance, except that part-time employees (working less than 30 hours or four days a week) are exempt for the purposes of determining the penalty. This is another reason that part-time work – especially positions with 29-hour weekly work schedules – would increase at the expense of full-time work, at least if the mandate goes ahead as planned. All together, it looks like many of the jobs in the new year will involve less work.